Enterprise resource planning (ERP) is a mission critical application that is essential for end-to-end support of an organization. It provides visibility to decision makers, helps to promote efficiency and collaboration, and provides a complete system of record. 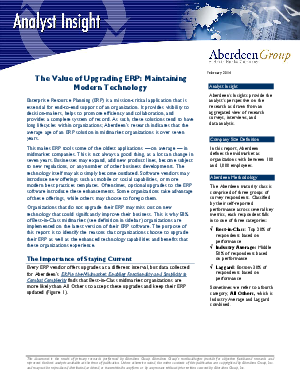 As such, these solutions tend to have long lifecycles within organizations; Aberdeen's research indicates that the average age of an ERP solution in midmarket organizations is over seven years.